Health Care Renewal: BLOGSCAN - Electronic Health Records: Should Congress “Defund” the Stampede to Convert to EHRs? No, But . . .
BLOGSCAN - Electronic Health Records: Should Congress “Defund” the Stampede to Convert to EHRs? No, But . . .
Maggie Mahar over at HealthBeat Blog has written a piece on Jan. 31, 2011 entitled "Electronic Health Records: Should Congress “Defund” the Stampede to Convert to EHRs? No, But . . ."
It cites my Jan. 28, 2011 HC Renewal post "US House of Representatives Proposes to Defund Largest Non-Consented Medical Experiment in U.S. History: HITECH." ... The more I think about it, the more I am reminded me of the bull market of the 1990s. Then, as now, neither buyers nor the analysts, brokers and financial planners who sold them stocks possessed the knowledge that they needed. “Momentum” was all as the pace of investing quickened. As for the “collateral damage”—our economy is still recovering from the 1990s. I hope the medical world will not find itself recovering from the "collateral damage" that too-soon, frantic adoption of not-ready-for-prime-time health IT can cause. There is a large demographic of front line doctors practicing that are already eligible for retirement. By 2015 there will be another large group of doctors at or nearing retirement. As a business person I have to ask: What is the incentive for these doctors to become involved with an EMR system? When you look at the ten’s of thousands of dollars involved, along with the practice disruption, I could see an economic justification for many doctors to forego this technology and simply retire when the penalty phase kicks in. They also are presented with the very attractive option of becoming a cash only, or retainer practice, thus eliminating any need for an EMR that meets a government standard. With the planned introduction of millions of new patients with some type of government insurance we will see a corresponding exodus of the front line doctors needed to treat them, and most of these patients will be complex. The economics of the situation point to chaos. Not having studied economics or business -- other than working in my father's private drug store and watching him manage the business -- even a physician/computer informaticist such as I can see that. One serious problem in such development is when those funding or doing the development fail to recognize what is involved in (and cost requirements of) good user-interface design. Creating user personas, observing users actually at work, creating prototype interfaces and doing usability tests with actual user representatives---that is essential to any good system, but it's still often not recognized as the critical component of the development effort. I would beg to differ but I think health IT is here to stay. 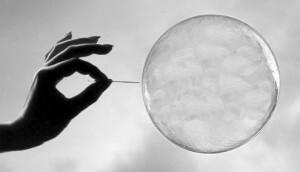 It isn't just a bubble that can burst at any time. HIT addresses a need for easy communication and facilitation of vital data to our health system which would enable our health practitioners to provide faster and more efficient care. However, there are still a lot of room for improvement on HIT.